No tennis fan worth his or her salt expected Rafael Nadal and Juan Martin del Potro to play this match in a drama-free, light-hearted manner. A beatdown was never in the cards, what ensued, however, was far more drama than we bargained for. Nadal pulled out the victory over the 6'6" Argentine 7-6 (6), 3-6, 7-6 (4), 6-4. Everyone knew this was the most titanic of matchups, two adversaries with massive artillery ready to lay waste to the lawns of ever genteel Wimbledon. The only thing dampening the potential of a blockbuster rivalry between the Spanish speaking titans has been injury which has been less a subtext and more the headline of their history. The last time the two were scheduled to play was on the clay of Madrid earlier this season, del Potro had to pull out of the match with a hip injury. 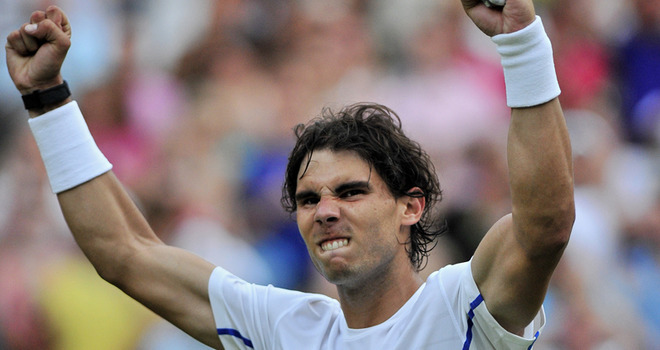 Nadal dominated a 2010 that for del Potro was lost to an ill-timed wrist injury. The combatants met four times in 2009 with del Potro winning three. That slice of history tantalized stat hounds with the possibility that a coup d'état was under way; that The Tower of Tandil may supplant the Man from Mallorca sooner rather than later. Well, yes, del Potro beat Nadal in a close match in Miami in 2009. The next matches were rehab starts for Nadal. In Cincinnati, he was on the comeback trail from the tendonitis and emotional upheaval that cost him his the defense of his French Open and Wimbledon crowns in 2009. While at the US Open, Nadal famously "broke" his abdominal. Is it any wonder neither of these guys could get through the match without an injury? It may be a mandate that these two can never play fully healthy. It was already questionable as to whether del Potro was back at full strength, but then he fell to injure his hip in the third set. Nadal, on the other hand, is still trying to figure out the origins of the foot pain that bedeviled him since the first. Ultimately, the match was tense, terse, topsy-turvy and a brilliant display of tennis from two of the era's greatest players. We wish both a speedy recovery, del Potro so that he can make a run on the heardcourts where he won his first major; Nadal so that he can face Mardy Fish healthy on Wednesday. If we needed further confirmation that Rafael Nadal is as close to a warrior as you get in sports, take today's match as evidence. What's the opposite of a warrior, then? Ugh! I sincerely hate to pile on to Caroline Wozniacki. I've never been in her presence, but she seems to strike everyone she meets as a sweet girl and a class act. I remember reading about her visit to Serena Williams before Indian Wells during Serena's injury imposed exile. I always see her tweeting with "rival/BFF" Victoria Azarenka saying "Girl, we've got to get dinner" (paraphrasing only slightly). She made the patriotic, if questionable decision to play her home tourney on an indoor hard court in Copenhagen the week before Wimbledon. Oh yeah and she'll still be World No. 1 for at least another month. That said, what do we make of today? What do we make of a day when Serena and sister Venus Williams both tumble of the tournament, opening the draw wider than the Beltway? A day when Wozniacki wins her first set over Dominika Cibulkova 6-1 and the train just flies off the track? What really, can we say? In all fairness, Cibulkova won this match, but you get the feeling Serena, Venus, pre-yips Maria, Kim, Justine would never have let it come to this, not at Wimbledon. So what do we make of today? If I'm Wozniacki, after the understandable tears, screams, dinner with Azarenka, etc., I pick myself up, dust myself off and make changes. Maybe it's time for dad to be dad and not your coach. Maybe it's time to see a sports psychologist. Maybe, you look at your schedule and do some ruthless bloodletting. Maybe instead of playing too many tournaments, you play singles and doubles at some big events (including the US Open) to give yourself a chance to feel what it's like to win the big one. I made a similar call to Maria Sharapova in a post last year: get mad, fire your coach, change your attitude to the sport, losing is not OK, not at the upper echelons of the game. Caroline Wozniacki didn't get to World No. 1 by being a loser, but she won't stay there unless she changes things to win. I knew if she got this far, it would be Marion Bartoli, who would knock Serena Williams out of Wimbledon. She was one of my early picks to make the final, she and Kvitova. I remember sitting next to her father and coach Walter at the US Open a couple of years ago, I had a brief conversation with him before the match in French, pleasantries, little more. I remember that match not so much for being a faux member of the entourage as I do for the glares. Marion shot her father some absolute melt-your-face-off laser beam glares during that match, I think I left after a set, I couldn't stand the heat. Bartoli is one of the few players who wouldn't be overawed by the comeback of Serena Williams, she's French after all. Would you expect her to be impressed? Just kidding. Bartoli strikes the ball with two hands off both sides, which presumably hinders her movement somewhat, but gives her the firepower to match the American's brutal pace of shot, not to mention find some unspeakable angles. She's also not Maria Kirilenko, she's been to the business end of Wimbledon before, losing to Venus in the 2007 final. She was coming off a semifinal in the French Open and won the Eastbourne tuneup (formerly known as the Martina Navratilova invitational for the 11-time champion) last week. So why exactly was this an upset? Not sure, but I wish I was in Vegas for this match, I would've cleaned up handsomely. Precious metal wrist watches, such as every other precious metal jewellery, are available in various hublot replica. If you would like some thing affordable attempt some thing within precious metal plating. Yet, if your actually want to obtain enduring worth inside your buy think about strong precious metal. Additionally a benefit is actually the truth that Precious metal jewellery may be used within the the majority of informal associated with circumstances. It'll dazzle an easy ensemble. Simultaneously, it'll in no way obtain dropped, actually within the the majority of official associated with clothes. Precious metal Females hublot replica sale tend to be absolutely no various. Placing 1 upon could be a maximum of a good afterthought, but this can make an entire ensemble get together. Precious metal jewellery may be used within the the majority of informal associated with circumstances. It'll dazzle an easy rolex replica sale. Simultaneously, it'll in no way obtain dropped, actually within the the majority of official associated with clothes. Precious metal Females Wrist watches tend to be absolutely no various. Placing 1 upon could be a maximum of a good afterthought, but this can make an entire ensemble get together. In the event that searching great is the objective, after that precious metal females rolex datejust replica uk tend to be ideal for a person. The precious metal view is really a ideal item whether you will the official occasion or simply searching for some thing in order to put on gently. Everyone knows which precious metal may be utilized because the dawning associated with breitling replica uk to exhibit processing. Along with a lot of designs obtainable, you will be able to look for a view you require.